A media kit is something that’s essential for bloggers if they want to monetise their blogs. Given out to brands and PR agents, it is usually a PDF document that promotes your blog and convinces PRs to advertise on your blog and to sponsor blog posts. It’s a great tool for helping bloggers to actually earn money. So what does your media kit need to have in it? – Lovely photographs from your blog and some close up pictures of you – make sure you look friendly and approachable! – Your figures – include unique visitors, subscribers and anything else that’s noteworthy, just make sure they’re worth shouting about! – An introduction to yourself and your blog – sell yourself! – Your features list – include all the topics that you usually write about, plus any special regular features that you have. – Your contact details – include as many as you can, your email address is the most essential as most communication will probably be digital, especially if you have a full time job alongside your blog. – Testimonials about your blog – if you don’t have any, ask your family and friends to write some for you. Make sure your media kit uses the same artwork and font as your blog does – you’re building a brand and so you want it to be recognisable. This is the same across all of your printed materials including business cards. Your blogger media kit will also need to be in a high resolution (at least 300dpi) in case you need to print it out for events or meetings. If you’re awesome at design then you can do it yourself but if you’re anything like me, you’ll need someone with a bit more know-how to put something together for you. 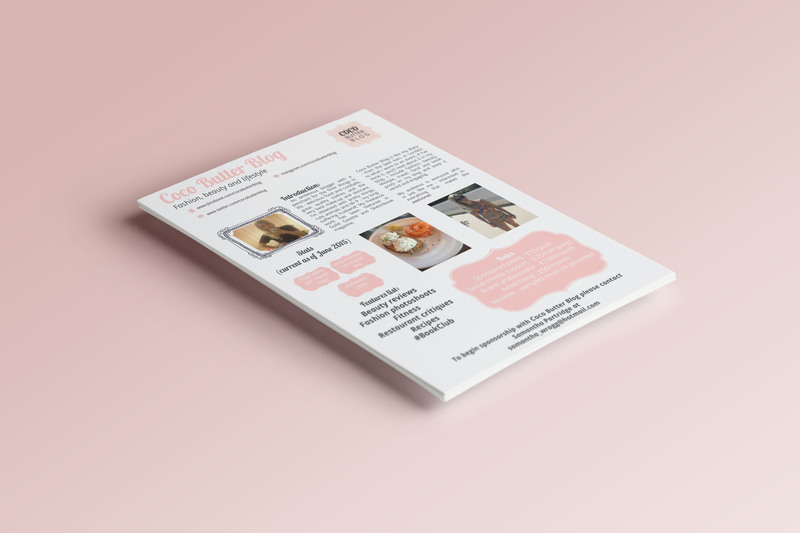 My media kit was designed by the lovely Charlotte Cobb from F & R Designs who can be reached by email on charlotte@fandrdesigns.co.uk and if you mention my name in the next three months you’ll get a 50% discount!